Version 2.157 on Ubuntu with Java Wrapper to start the isntance. I am running into an issue where old builds are not getting cleaned up automatically or manually. 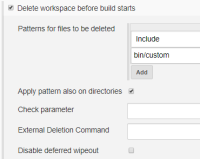 Deletion of the build failedRetry deleteShow reasonjenkins.util.io.CompositeIOException: Unable to delete '/var/opt/jenkins/runner/1.0/bin/linux-x86-64/../../data/jobs/tutorial_lombok/builds/.4'. Tried 3 times (of a maximum of 3) waiting 0,1 s between attempts. Moreover, when I upgraded some plugin, Jenkins failed to restart saying that the deploy plugin folder could not be deleted. After manually deleting the file .timestamp in the folder, it was OK. Seems there is an issue with file having name starting with a dot. I've discovered a regression in Util.isSymlink that relates to the can't delete files in a symbolically linked Jenkins home (or other symlink issues). Including in this fix. Matt Sicker added a comment - 2019-01-10 20:00 I've discovered a regression in Util.isSymlink that relates to the can't delete files in a symbolically linked Jenkins home (or other symlink issues). Including in this fix. The code that introduced this regression has been reverted and merged in Jenkins core master branch (https://github.com/jenkinsci/jenkins/pull/3845). An out-of-order release is being pushed out. Expect 2.159 in a few hours. https://github.com/jenkinsci/jenkins/pull/3841 then will be worked on again to reach a satisfying end state fixing the original issue at stake. Baptiste Mathus added a comment - 2019-01-14 20:02 The code that introduced this regression has been reverted and merged in Jenkins core master branch ( https://github.com/jenkinsci/jenkins/pull/3845 ). An out-of-order release is being pushed out. Expect 2.159 in a few hours. https://github.com/jenkinsci/jenkins/pull/3841 then will be worked on again to reach a satisfying end state fixing the original issue at stake. thanks and working fine now. rupkumar p added a comment - 2019-01-15 03:22 thanks and working fine now. It works for me also. And also in all modules folders. Daniel Beck added a comment - 2019-01-16 17:45 Fixed in 2.159.